I found citrate positive in the experiment.Are you sure of the results? Which enterococci are typically indole positive and which are indole negative? The main two I would like to know is E. faecalis and E. faecium. Is there a permanency for any of them? E.g. Proteus mirabilis is always indole negative. 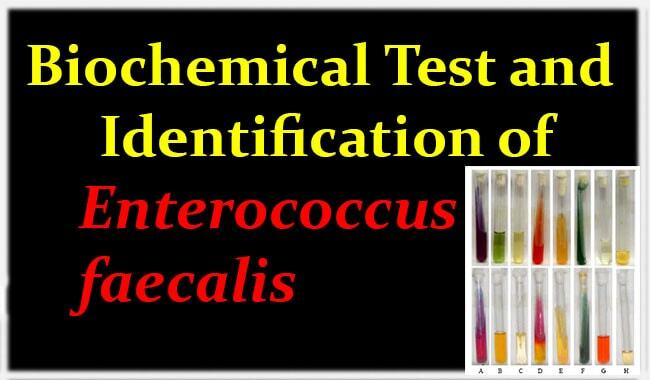 How can Enterococcus faecalis can growth on macConky agar? While macC. is selective media for gram negative bacteria and inhibition gram positive bacteria? Could you please provide me with information of E. faecalis? I would need to know the culture conditions: humidity, temperture, culture medium, etc. and if this strain can be confused with other strains and the main reasons. Enterococci produce magenta red small colonies on MacConkey Agar, is tolerant to 6.5% NaCl, can grow at 42degree C, and Bile Esculin Positive, in Sodium Azide broth. I wonder !!!! The bile salt and Crystal violet was inactive or what ??? Pls, explain. E. faecalis also grows in the presence of bile and hydrolysis aesculin. We use a bike- aesculin plate for this purpose. If positive, the medium turns brown. My nitrate reduction was negative. It turned red after zinc was added making it a negative result. I’m doing some research about E. faecalis and the VP gives me inconclusive, just as Mac Faddin’s book. I think it is one thing you should change. Results in Nitrate reduction can be inconclusive, but most of the time it leans to a positive result. The possibility of it being negative is probably because of malpractice or the nitrate compound was already reduced and the addition of Zinc may have reacted differently. If the tube turns red after the addition of the zinc, it means that unreduced nitrate was present. Therefore, a red color on the second step is a negative result. The addition of the zinc reduced the nitrate to nitrite, and the nitrite in the medium formed nitrous acid, which reacted with sulfanilic acid. The diazotized sulfanilic acid that was thereby produced reacted with the α-naphthylamine to create the red complex. Hi Andrew, could you please declare the reagents A and B mentioned on above comment? Thanks a lot. Really love it. I am a B.Sc Microbiology graduate and very passionate about Microbiology. I am currently seeking a masters degree. Please could you send me some Microbiology articles and latest information and researches. This was very helpful. E. faecalis also hydrolyzes esculin in the presence of bile, differentiating it from non-enterococcus group D strep.